Baikonur blog – launch day! More launch pads, SoyuzTweetup and a Launch! 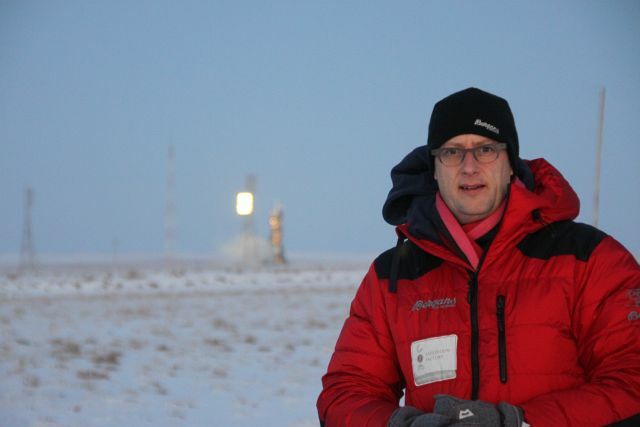 Baikonur, 21 December 2011 – Finally. Today is the day we have been living up to for a long time. The launch of Soyuz TMA-03M, with ‘the’ Dutch astronaut André Kuipers on board. It is still dark outside when I wake up around 8 o’clock. Today our program consists of two major visits. First we will go to the furthest launch location at the cosmodrome: the Proton launch facility. Then we have some time in the city before going to launch pad 1 for the launch in the early evening. We have breakfast at our hotel. The Kazakh lady serving our breakfast traded some foreign coins and bills with me yesterday. This morning she has a written note with an English sentence on it. So with a big smile she reads: “Present me the money”. Totally unaware of her bluntness she clearly wants to do more money swapping. Her second line reads “I collect money”. Funny. Who doesn’t? Yesterday I traded a 5 Euro bill for a 1 Kyrgyzstani Som bill and a handful of very small Kazakh coins. Now she wants to trade my 20 Euro bill for other Russian and Kazakh change. Only when writing down the exchange rate, explaining that my 20 Euro bill is worth a whole lot more than her 20 Tenge coin, she continues serving us breakfast. I can only afford to lose money to a certain amount… I hope she understands. At 9.30 Elena walks in to collect us. Driver Said and the security lady are already in the van. We have a long drive ahead of us, to the Western side of the cosmodrome. On our way Elena tells us that the Proton workforce has a 2-hour each way train commute to the rocket processing plant at site 92. Most of them cannot afford a car, so the trains are their only way of getting to work. Despite its size, the cosmodrome only has one entrance, where both the road and railroad enter the site. This road then continues for about 25 kilometers before forking into the east, central and west roads. And for those familiar with the main entrance road to Kennedy Space Center, in between the gate and the VAB: that road is a super highway compared to the main cosmodrome road. Because of the harsh climate the simple 2-lane road is narrow and bumpy. Another interesting comparison is the wildlife. On Kennedy Space Center you can spot alligators in the canals on the side of the road. And occasionally you see manatees in the small lakes around the launch pads. The cosmodrome offers equally interesting wildlife spotting. There are camels grazing the grassy patches along the road, also in the middle of winter, and you see large herds of half wild horses. The most remarkable animal I noticed though was the dog walking across launch pad number 1, within an hour of launch. You can see it in the long-version launch video on the ESA website. So today we take the road to the left. The west side of the complex is almost exclusively dedicated to the Proton launch system, although there are a few Dnjepr launch silo’s hidden along the road in that area too. The Proton launch system is one of the most successful systems the Russians have been using for unmanned launches. It has its own vehicle processing facility at site 92, and two active launch sites, complexes 81 and 200, both equipped with two pads. After over an hour on the road we turn right at a sign simply saying ‘200’. An ever smaller road leads to launch site 200, where we stop at a simple gate, closed with a rusty chain. Our security person has a chat with the non-uniformed guard here and he removes the chain. We continue on to a relatively new building, where a big man in a Roscosmos jacket enters the van. He will be our tour guide at this launch site. He introduces himself and starts talking enthusiastically about the place. He seems very passionate about his job and Elena has trouble interrupting him to translate. He has been working on the Proton launch system for 36 years, having prepared over 400 launches from this and the adjacent site. He tells us this is the most active launch pad at Baikonur, with 7 launches in the past two months alone. Next launch is scheduled for 26 December, with the Proton-M rocket arriving from the site 92 VAB on the 24th. Our driver parks the van almost on the pad, close to the launch pit and service tower. We walk the last meters to the pit with our four chaperones. The passionate Roscosmos guy likes our enthusiasm. Despite the language barrier we fire lots of questions, that he is very happy to answer. I love these passionate space workers! He is obviously very proud of his work and the success of the Proton system. Again we are positively surprised that we can wander all over the active launch complex, touch the launch tower and take all the photos we want. There is a test cylinder in the launch pit, connected to a thick bundle of cables. The man explains that this unit is to test the launch pad connections to the rocket. It has the same electrical systems as the actual rocket that will be here two days later. We step onto the bridges from the platform to the test cylinder to look down into the deep flame trench and up into the launch tower, directly over our heads. Although constructed in the late seventies, most of the structure looks brand new, with a fresh coat of paint and shiny pipes leading to the fuel and launch control bunkers just off the pad. After half an hour or so we get back into the van. Sometimes rocket processing site 92 is also part of the visit, but today it houses an almost ready-to-launch Proton-M, making the site closed to visitors. So we head back to the city for lunch. Our next program item will be the launch itself. In the van Elena tells us that our launch watch permits have been approved by Roscosmos in Moscow last night, so we can definitely watch the launch. Huh? What is that supposed to mean? Do we need a separate permit to watch the launch? Nobody told us that. We just assumed that the 3-day cosmodrome permit included the launch. Well, apparently not. We are happy she didn’t tell us before! It would have been extremely worrying not knowing whether we could attend the launch or not. Now we know. We will watch the launch from site 18. This site houses the telemetry and communication systems for launches from pad 1, as well as the press and VIP launch viewing platforms. They will pick us up from our hotel around 17:30. After a big lunch at our hotel we walk to town center, where we discovered a ‘Free wifi’ sign at the door of what we hope will be a bar or restaurant. When we enter the wooden door we are greeted into a large diner-style café/restaurant by a few nice staff members. The walls are decorated with neatly arranged Soyuz crew pictures, all the way up to the TMA-22 crew, the last one to be launched a few weeks earlier. Another nice surprise in Baikonur! We sit down at a table equipped with electricity and fire up the laptop. Free wifi indeed! We order a few soft drinks and enter the virtual world, for the first time in almost a week! I had been twittering via text messages, which is pretty much one-way sending, without any interaction with friends and followers. Once logged on to Twitter I am overwhelmed by the enormous amount of replies, mentions and retweets of my followers. I knew a few people would be following my Baikonur adventure, but never realized it would be that many! It is great to finally be able to respond to people and also to send much anticipated pictures of what we had been doing up to that moment. It is great to interact with my followers in a two-way fashion for a few hours. It is actually one of the most emotional moments of the trip, realizing that so many spacetweeps are virtually travelling with me! Thank you guys! At around 16:45 it is time to walk back to the hotel. We have to prepare for a cold evening at the launch site, so we need to put on even more clothes and make sure our photo and video equipment is fully prepared. When we leave the café it is already very cold and a little windy, but still sunny and crystal clear. Perfect launch weather! While discussing our excitement about the upcoming launch Bas and I ‘invent’ a new Russian #SpaceTweetup ‘tradition’. Since Russians have vodka at every celebration, no matter how insignificant, we have to drink to this very significant event too. But we don’t want to drink to a successful space mission before it is over. So we decide to purchase a few bottles of ‘Space Vodka’ in Baikonur, from which we will drink only a few drops to celebrate a successful launch. The remainder of the bottles will stay untouched until the crew returns safely back to earth, months later. Once their safe return has been confirmed, we will drink it. Not all alone, but with as many spacetweeps as possible! Just like the Russians share their bottle with others. So on our way back to the hotel we visit our our favorite ‘Bas’ grocery store and we ask for ‘Baikonur Vodka’. They laugh and say it doesn’t exist. We look at the dozens of brands they do have, but can’t decide until the nice attendant proposes ‘Putin’ vodka, which sounds just perfect! While paying she says that she also has ‘Medvedev’ vodka. That is just too funny, so I purchase a bottle of the ‘other’ Russian leader as well. At less than US$ 4 per bottle it makes you wonder about Russian political ethics. But then again, this is Russia, so it must be OK. The ‘Putinska’ vodka becomes our Space Vodka! Purchased in Baikonur! We arrive at the hotel just after 17:00, well in time for our agreed 17:30 departure. To our surprise Said and Elena are already there and ready to go. So we quickly grab our winter clothes and equipment from our rooms and get into the van. It is good to leave a little earlier, as we will now be able to see the rocket in the last daylight. The launch will be in darkness, and we have not yet seen the rocket at the pad from close by. Our early departure increases our chance of daylight pictures. So we leave the hotel at around 17:15. We drive to the Tsenki office to pick up our security guard friend, who arrives without her usual big fur hat. She is apparently not planning to leave the van during the launch. I ask Elena about traffic to the launch site, and the expected lines at the security gates. She has no idea what I am talking about, saying she does not expect any delays. Obviously I am thinking about my experience at Kennedy Space Center the morning before the last Space Shuttle launch. That launch, last July, attracted over 750,000 viewers at the Cape, causing massive traffic jams going into (and even worse getting out of) the Space Center. The city exit checkpoint is passed without even stopping. The road towards the cosmodrome seems not too busy. There are no other cars at the main cosmodrome gate and here too our driver hardly needs his brakes. On the main road it is even more surprising. It is the end of the workday and we see many buses and a few full trains going into the opposite direction, off the cosmodrome! Just like any other workday people are leaving around 5pm to go home for a hot meal. We seem all alone getting onto the cosmodrome, driving towards the clearly visible site 254 VAB. A sharp contrast to the last time I drove towards a VAB for a launch! About 10 minutes before we are to arrive I get a phonecall from a regional Dutch radio station. They ask me if they can do a live radio interview with me in about 45 minutes, 30 minutes before the launch. More public outreach opportunities! Great! Under a beautiful pink-orange sky we leave site 2 to drive to site 18, from where we will watch the launch. Soon we see the rocket on its launch pad. Wow, what a view! And we keep getting closer and closer. Already from the van we see white clouds steaming out of the rocket, which is clearly visible, but still encapsulated in the service structure. Pad number 1 is beautifully lit, although there is sufficient daylight left to see it all. Just before reaching the buildings at site 18 we turn left, getting even closer to the rocket. Now there is nothing in between us and the launch pad. No fences, no trees, no buildings, just open steppe. Police have taped off a few acres of what could be a parking lot, at a few hundred meters from the site 18 launch telemetry buildings. There are only two other cars, so we drive to the edge of the area closest to the rocket, where police asks us to park the van backwards. With the back of the car facing the rocket we can probably leave quickly in case something goes wrong? Whatever the reason, we are scarily close to the rocket. I estimate the distance to be something between 1 and 1.5 miles. There is no shelter, just open plains. With the sun setting the wind seems to be picking up, making it even colder than it already is. I am sure it is well below -25°C (-13°F). Later we heard it was -34°C (-30°F), with a wind chill making it feel like -40°C (-40°F). We are not at the same site as the press or the VIP’s. They are a few hundred meters to our right, where the buildings are. We see an observatory-like building with its dome half opened towards the launch pad. We conclude that this must be the press site. They are at the same distance from the launch as we are, only slightly more protected from the elements. After our arrival things happen very quickly. I set up my tripod and prepare my cameras. I do not want to watch the launch through my camera lens, so I take my pictures now and set both cameras in video mode. Because of the extreme cold I remove the battery from my main camera after taking pictures of the tower and retraction, about 30 minutes prior to launch. I put it in my pocket to warm up. It went from 100% charged to empty in 15 minutes! Five minutes in a warm pocket will certainly bring it back to almost full again. 15 minutes after our arrival we see the service structure retract. It very slowly folds away from the rocket, on two sides, exposing the beautiful sleek white rocket. It continues to blow out large white clouds, that quickly drift away in the wind. Then about 10 minutes prior to the launch, when it has gotten much darker, the umbilical tower quickly folds away, leaving the rocket hanging in its four support arms, connected to the pad through the small umbilical tower. We know that this means that the rocket has now been switched to internal power, and the countdown process is fully automatic. In between these launch events I do my live interview on the radio. After a pleasant conversation the host asks me if he can call me again after the launch. Fine with me! Holding my phone tweeting and talking has almost frozen my fingers, so I rush back into the van to heat up. The driver leaves the engine and heater running. Temperature difference inside and out is almost 50 degrees centigrade! Darn, my fingers really hurt! But I do want to get outside as soon as I can. Most of the van windows are frozen, although the huffing and puffing rocket remains clearly visible from the back windows. About 15 minutes prior to launch time I climb outside again. I put the battery back into the camera, which shows as fully charged again! I hope it will last for the next 20 minutes or so, in the exposed and now very cold camera. At this time a few more cars arrive, bringing foreign space workers to see the launch. At least I think they are, as they are being driven in Tsenki (Center for Ground-Based Space Infrastructure Facilities Operations) vans and they speak English and Italian. But still there are less than 100 people at the large viewing area, and most remain in the warmth of their vehicles. It has gotten completely dark over the launch site and many stars are visible over the platform. At T-20 seconds the last umbilical structure folds away. Then 10 seconds later we see an orange glow coming from underneath the pad. The engines are started! A few seconds apart we see and hear bright orange explosions, as the 20 booster and stage-A main engines are fired up. A buldering sound and bright yellow-orange glow, but still no movement of the rocket. Is this normal? I try to detect movement of the rocket. But before I can get too worried, the yellow glow turns into sun-strength bright white light, when the rocket starts moving upwards. With a modest roar the entire scene turns into a bright white ball in my eyes, making it impossible to distinguish any details. Bright as the sun, the white ball slowly, then rapidly moves up. The entire steppe suddenly looks like it is day again, lit by 20 powerful rocket engines at full throttle. Wow! Even brighter than the Space Shuttle, but with a lot less of that typical crackling noise, the Soyuz very quickly accelerates into the clear night. After 10 or 15 seconds the landscape slowly turns dark again, with the bright light becoming slightly fainter. After 20 seconds the white turns yellow and then orange, now exposing a long smoke trail. Wow, this is a fast rocket! It seems to accelerate much faster than the much heavier shuttle. At that moment I see my camera battery giving up. About 30 seconds after the launch the red empty battery symbol briefly blinks, before the camera shuts itself down. Well, at least it caught the launch in video mode! I get out my compact camera to film the speeding rocket, now a moon-like bright spot high up in the night sky. The spot slowly shrinks, until I can’t really film it any more. We wait another minute and see the rocket briefly shutter when it separates its four liquid propellant boosters, continuing to fly on its four stage-A engines. A short moment later we see a dim orange flash when stage-A is separated and the second stage engine takes over. Then it very slowly disappears into the distance. We have been able to follow the rocket for at least 6 minutes, well away from Kazakh airspace. Its curved north-eastwards trajectory clearly visible. While we were watching the rocket speed away from us, we see the police removing the tape around the lot. The first cars already leave within two minutes of blast-off, apparently too cold to wait for the rocket to have gone completely. So 10 minutes after launch we are among the last people still around. Just before I want to get back into the van the radio station calls again. I tell them about the excitement of the launch, the brief moment of worry and the bright lightshow. I also mention the bitter cold. I want to get back into the van! On the way back we find the road almost empty again. When we are on the main road to the exit checkpoint we take out our Space Vodka and tell Elena about our new ‘tradition’. She is amused about our silly idea and is happy to let us take our small launch-success sip straight from the bottle. Yay! A new tradition is born! Hopefully we can get the already-opened bottles home safely (afterwards note: we have!). When we reach the city entrance checkpoint the van suddenly dies. The interior lights turn off and so does the engine. Under the checkpoint lights Said steers the van to a stop on the side of the road. The ignition key doesn’t do a thing. Not even a sound. Then the van fills with the sharp smell of electrical smoke. Must be a short circuit somewhere. Not really a surprise after the bumpy rides during the past 3 days. And what a luck that it didn’t happen earlier that evening! We are not really in the middle of nowhere and the launch is over. It is only a minor inconvenience that it is quickly getting cold inside the van. We are warmly dressed and could walk to our hotel in 15 minutes if needed. But Elena is quick to call her boss to send another car to ‘rescue’ us. It arrives in about 10 minutes. But instead of taking us, the delivery van will tow us back to our hotel. And so it goes. Towed by a delivery truck we cross the checkpoint for the last time this trip. Then, driving 20 kilometers per hour, we suddenly hear police sirens behind us. Will they stop us because of the strange tow? No. After 10 seconds a convoy of several police cars, followed by Roscosmos buses and large SUV’s zooms by. It is the bus holding the Soyuz backup crew! After a few hundred meters they take the Cosmonaut Hotel exit and we see the blue lights drive through the hotel gates. About 10 minutes later we arrive at our cheap hotel, in our slightly less spectacular ‘convoy’. A strange, but adventurous and certainly memorable end to a very memorable trip! A spectacular night launch from an extremely remote launch site, in extreme cold. Something only a handful of spacetweeps have experienced!